It seems that lately numbers have become an important part of our life. As most of you know I hate numbers and math but Troy is much better in that department than I. When I went to my doctor's appointment yesterday they warned me when I sat down that my blood pressure number had to be within a certain range to keep me out of the hospital. The goal was the bottom number had to be less than 98. Well my bp was 148/97. Talk about just barely getting by! I will take it and see what today holds and hope this medication keeps on working. Miss Ava also has many daily stats. I won't bore you with them but as soon as I get there each day they provide me her daily stats. Most of them go over my head but I am learning. Yesterday Dr. J decided that starting this morning (Friday) she would increase her feeding to 25ml a day. This is just so great and it is important to keep her growing. She also had a good stat from yesterday..she now weighs 4 lbs 7 oz! Today during feedings Ava and I will talk about the Husker football game tomorrow. 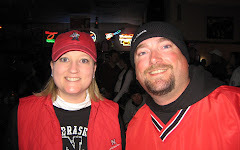 She wears her little N hat faithfully and has converted many nurses in the NICU to become Husker fans! Last night she was sound asleep in my arms after her feeding when Troy came. As soon as she heard her Daddy's voice she opened her eyes and started smiling..what a great way to spend the evening. Maybe that is when they should check my blood pressure!? Well more updates likely after the weekend. GO BIG RED! Well, things seem to be looking up! I love that she woke right up when she heard Troy's voice. Funny how babies get used to mom and dad's voices in the womb. I pray that the weekend goes well; may your blood pressure continue to drop and may Ava keep on growing! Yay! Sounds like Miss Ava is doing well. I can't wait to meet her :) Much love to you, Troy and Ava!